The Work of Byron Katie. A revolutionary process for ending stress. "For anyone who has the courage to question what they believe. What we are believing is our identity…and it takes a lot of courage to inquire. But there is something that takes even more courage…and that is to live without it. Anyone that is living a life — even a moment of suffering — just know you have the courage." On this site, page after page, I have done nothing more than ask you to change your mind. And while that's just one simple statement, and one you've probably heard before, no one seems to be telling us HOW to change our minds. Well, Byron Katie's "The Work" is the answer. Completely free, this process will free you from your stressful thoughts. Those thoughts that cause you stress, that always seem to say, "This shouldn't be happening." This process will gently put you back into the nature of things, and allow you to respond authentically and kindly. So what is "the work"? It's four questions and then a complete turnaround of your stressful thought. 2. Is it absolutely true? 3. What are you like when you have this thought? 4. What are you like WITHOUT the thought? Then you turn your thought around to its OPPOSITE. It's not that you change your mind...it's more like your thoughts leave you...effortlessly. 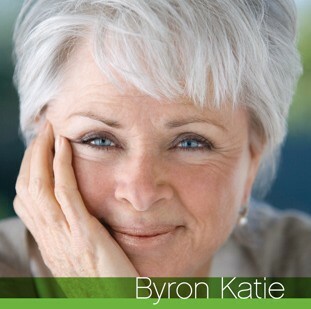 Visit the Byron Katie Channel on YouTUBE. 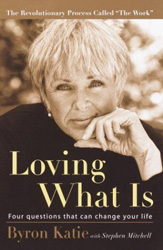 "The little book" which is a PDF excerpt of Byron Katie's "Loving What Is..."
22 KEY PAGES FROM HER LANDMARK BOOK "LOVING WHAT IS". "An unquestioned mind is the world of suffering. So, how do you get back? To begin with, just notice the thoughts that take you away from it. You don't have to believe everything your thoughts tell you. Just become familiar with the particular thoughts you use to deprive yourself of happiness. It may seem strange at first to get to know yourself in this way, but becoming familiar with your stressful thoughts will show you the way home to everything you need." Do You Use "The Work" ? If so, you know its power to change a life. Please share your view of "The Work" and how it has helped you during a stressful time.